Any petrol head will tell you that until you’ve owned an Alfa you aren’t a proper petrol head. Alfa’s have never had the best reputation for build quality or reliability but they have made some stunning looking cars that also drive really well. As you may expect, I’ve owned one Alfa, I bought a 156 when they came out. My car was 3-litre petrol and when you started it, the car just sounded amazing. The car I owned was surprisingly reliable but that didn’t stop buttons falling off the seats and trim coming away all over the shop! That said, when you drove the car, it just put a smile on your face; the performance was up there with its German rivals, even if the build quality wasn’t. Another thing Alfa has is a very loyal customer base; they are a very passionate bunch who love all things Alfa. The car I’ve had the real pleasure of driving this month is the new Gulia, when I was given the choice of driving the Diesel or the range topping Quadrifoglio, it was a no brainier for me. The Gulia is rear wheel drive and this is no doubt to take on its German rivals from BMW and Mercedes. The last Alfa that was rear wheel drive was the 75 which ceased production 25 years ago. The Fiat Group, who own Alfa, are investing over £5Billion to make Alfa great again. After driving the Gulia I can say this investment is starting to pay off and they have also entered the very lucrative SUV market with the Stevlio. I haven’t driven that yet, but watch this space! The Quadrifoglio is clearly aimed at the Mercedes AMG, AUDI and its RS model and lastly at the BMW M range. The designers have done a great job and the car really looks the part with carbon fibre all over the place and the impressive 19″ alloys really help make the car look extremely sporty indeed. 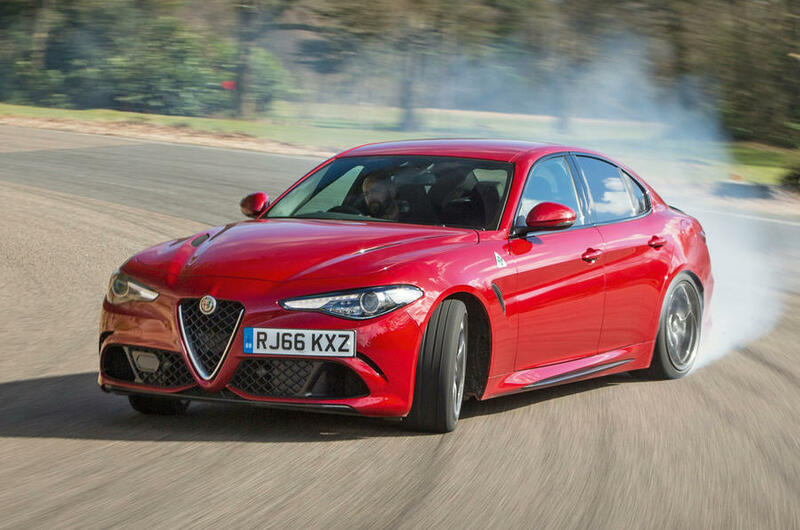 Alfa have used Aluminium in key areas to keep the body weight down and, in doing so, the car has excellent power to weight ratio of 318bhp per tonne. The 2.9litre V6 is turbocharged and it pumps out 503bhp. The engine has been inspired by Ferraris 3.9litre V6 which I’m sure isn’t a coincidence at all. The car gets to 60mph in under four seconds and its top speed is 191mph, driven sensibly the car should return most owners 30mpg. All UK Quadrifoglio’s come with an 8-speed automatic gearbox and 19″ alloys as standard. The car I drove came with the optional ceramic brakes and Sparco seats. These body hugging seats are great and they make you feel like a Formula One driver. They do take up a bit of room for rear passengers and they are priced at £2950 so I can’t see many owners opting for them. The Alcantara rimmed steering wheel looked and felt great. My favourite bit was the starter button, I know I’ve said it before but simple things and all that. The cars ventilation dials and buttons are very simple and straightforward to use, its SatNav and communication system is also on par with its German rivals. The graphics and screen is a little bit cheap looking for me, but as with all Alfas – it’s all about the engine and the drive. The materials used in the car are good, especially with a good scattering of leather, Alcantara and carbon fibre all over help make the interior feel like quite a special place to be. The rear seats don’t fold which doesn’t make it very practical at all and with the boot opening being quite small, it doesn’t help at all when loading the car with cases, shopping etc. Driving the car in race mode really makes it quite a handful, if you aren’t careful. The cars exhaust note sounds really good and throaty indeed, making down changes via the gears and the exhaust pops and crackles like no one’s business. I know this is very childish, but I found myself looking for tunnels just to hear the cars soundtrack of pops and crackles. Beware driving the car in race mode – it turns off the traction control and this can make the car a real handful if you’re not careful. After driving the Gulia I can honestly say Alfa are back on track and in the hot seat (pardon the pun) for good times again. The car looks and sounds amazing and it will be quite a rare sight on the roads. Priced at £59k this car really ticks all the boxes for me and I’d have one over its German rivals all day long. Car courtesy of Richard Hardie Alfa Newcastle.